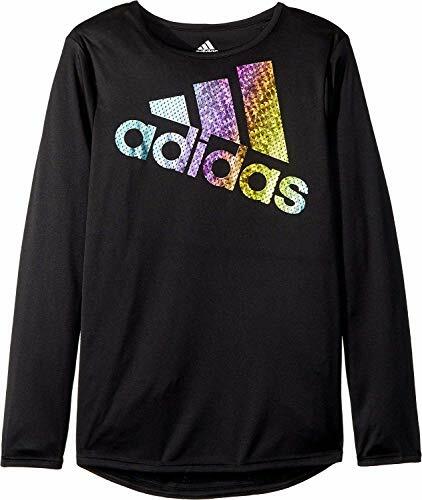 Fire up her motivation to move with confidence and shine in the bright adidas® Kids Long Sleeve Colors Ignite Tee. Regular fit is shaped close to the body and allows full range of motion. Lightweight weave adorns large brand marking with iridescent overlay for added style. Pullover styling. Scoop neck. Long-sleeve coverage. Printed tag offers added comfort. Droptail hem. 100% polyester. Machine wash, hang dry. Imported. Measurements: Length: 21 14 in Product measurements were taken using size MD (10-12 Big Kids). Please note that measurements may vary by size.